All the latest Movie Trailers, Competitions, News and Previews. Three Amigos! is out on Blu-Ray on the 23rd May, and to celebrate we have a great competition for you and 3 copies on Blu-ray to give away! For the first time available in the UK on Blu-Ray. Theyre down on their luck and up to their necks in Senoritas, Margaritas, Banditos and Bullets! Steve Martin, Chevy Chase and Martin Short travel a dusty road to adventure in this zany mix of sharp one liners and clever sight gags. The Three Amigos are a silent screen comedy act who have seen better days. So has a remote Mexican hamlet, which is being terrorized by a fierce bandit gang. Finally, in desperation, a naïve villager sends the actors a telegram asking for help. Thinking theyre being offered a fortune for a personal appearance, the hapless trio arrives in Mexico, only to discover this time that theyre dodging real bullets! 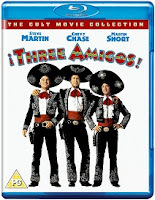 Directed by John Landis (Trading Places), here is an uproarious comedy about three bumblers who are in way over their heads but, come what may, theyll always remain the Three Amigos! To enter all you have to do is answer this easy question.. When the competition ends as indicated on this page, any and all entries received after this point will not count and emails blacklisted due to not checking this page first. Winners will be chosen randomly and will be informed via email. BeenToTheMovies.com - . Simple theme. Theme images by follow777. Powered by Blogger.